Outside India, Hindi speakers number around 8 million, distributed across Nepal, South Africa, Mauritius, the United States, Yemen, Uganda, Germany, the United Kingdom, Singapore, Fiji and the United Arab Emirates. On the other hand, Urdu is an Indic language (the official literary language of Pakistan) essentially identical to Hindi in its spoken form but, in its literary form, heavily influenced by Persian and Arabic and written in an Arabic alphabet. About 100 million people in Pakistan and India speak Urdu. 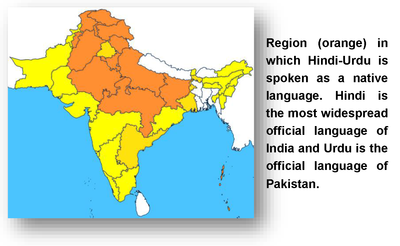 Linguists consider Hindi and Urdu to be dialects of the same language. Together Hindi/Urdu is the second most widely spoken language in the world. UC Davis currently offers two years of Hindi/Urdu (elementary and intermediate level). Students of Hindi/Urdu will also find a wide range of courses on cultures of the Hindi world at UC Davis. Learning Hindi/Urdu can be a rewarding and useful part of preparation for a wide range of careers in the private, public, or non-profit sectors. Students who have no prior background in the Hindi/Urdu language should register in Hindi 001: Elementary Hindi/Urdu 1. Students who have taken Hindi or Urdu in high school for two years or from other institutions are encouraged to take the language placement exam to determine what level of Hindi/Urdu (elementary or intermediate) in which to enroll. To schedule and learn more information about the placement exam, contact the Language Learning Center at (530) 752-1508.